First of all, we need to see that the level of God’s provision is abundance. We also need to note that the key to right giving is grace, which comes only through Jesus, through the cross and is received by faith. There are two key words in the above quoted verse. They are “all” and “abound.” “All” occurs 5 times, “abound” twice. In no way could the language be more emphatic. In fact, even though most English translations use the phrase “every good deed (or work)” the Greek is “all” good deeds. If you have all that you need in all things at all times to abound to every (all) good work or deed, there is absolutely no room for unsupplied need anywhere in your life! God is not speaking about just enough to get by. He is speaking about providing us with overflowing provisions so that we can overflow in every GOOD deed. If we by faith appropriate His grace, then the level of His provision is abundance. Wow, does it get any better than that? Receiving has a blessing, but giving has a greater blessing. God has no favorites among His children. He wants all His children to enjoy the greater blessing of giving. God makes His abundance available to us so that we may not be limited to the blessing of receiving, but that we may also be in a position to enjoy the greater blessing of giving. First we give, then we receive. That is faith. Simple? Yes. Then why is it so difficult for most of us? Perhaps it’s that interval between the sowing and reaping. We in America are so used to wanting and seeing immediate results that we forget what Paul said in Galatians 6:9: And let us not lose heart in doing good, for in due time we shall reap if we do not grow weary. One of the first things Jesus tells us is to repent and believe in the good news because the Kingdom of God is at hand (Mark 1:15). What is this Kingdom? How do we recognize it? While some say the Kingdom of God is in the future, others say it is today. Some believe it is allegorical, others see it as literal. Some even see the Kingdom as fulfillment of the promises God made to the Jews, while others believe it has nothing to do with the Jews! Some believe it pertains only to heaven, and yet others believe the Kingdom has an earthly presence. Nevertheless, The Kingdom is the singular most talked about subject by Jesus in His earthly ministry. You’d think we have a clearer picture. Let’s see how the King, Himself, described it in several of His parables. The Church (the people of God) is the visible manifestation of the Kingdom of God. How are we doing? Can those outside the Kingdom recognize us as subjects of The King? You decide. Have you asked yourself what you can do for The Kingdom of God but decided you didn’t have anything to offer? Keep the following in mind and then re-ask yourself if God can use you. So the answer is yes, YOU. God wants and needs you. He called you for such a time as this. As days go by, I hope I don’t stay the same. Most days I pray but some days I curse. It’s that number of days I put myself first. But it’s not what I do, the cross made that plain. Check out these lyrics by Lynda Randall. If this isn’t the truth, I don’t know what is. Some days drag. Indeed they do. And some days fly. For me, it’s the week-end. You say “what?” The week-ends for me mean no work, no real interaction with people, no family around. You see, I’m alone. Most Christians don’t think of people like me. And for obvious reasons. They are wrapped up in their own family and the activities and accoutrements that go with all that. I understand. However, it doesn’t make the week-ends fly even though I understand. And on those draggy, draining days, the mind begins to dwell on the thoughts that I am supposed to take captive, like when I might die. Growing older brings those thoughts to the forefront. Can’t seem to help it. They come. But then Lynda Randall puts it all in perspective with the next sentence. “And one day Jesus will call my name.” Hallelujah. That makes it all worthwhile! Then I remember, wow, how fortunate I am. Not everyone looks forward to that day. But He called me out of darkness into His marvelous light! Again the lyrics remind me that putting myself first, which in the US is so “normal,” are the days to curse!!! It means I have forgotten that indeed all will not be called by name by the Lord. And, I share responsibility in that because I have forgotten and/or neglected to share His love. Oh but wait, I don’t have to beat myself up and claim unworthiness because of my selfishness. Look at that next phrase “the cross made that plain.” In other words, it’s not what I do but who I am. I am a child of God, my life is hidden in Christ. Does this give me license to do whatever I want? Indeed not. It makes me remember what price has been paid for me to have that privilege. And I am renewed just thinking and knowing that one day Jesus will indeed call my name. In the meantime, as the Apostle Paul said in 1Cor2:2: I am determined to know nothing among you except Jesus Christ and Him crucified. I do want to draw so close to Him and to have Him live through me so that others see Him. Sometimes it seems impossible but with God, ALL things are possible. Check out the song, One Day by Lynda Randall on YouTube. https://www.youtube.com/watch?v=Qz58xcJHAJ4&start_radio=1&list=RDQz58xcJHAJ4. I hope it ministers to you as much as it has to me. In our typical American days and weeks, being bombarded with all sorts of negativity, it is so very easy to be “down.” I don’t know what triggers you, but for me it is loneliness, lack of finances, the feeling of uselessness, and frankly growing older. The devil, being who he is, doesn’t bring these things on us one at a time in order for us to deal with them systematically; but rather, he brings them all at once! When he does, the valleys of life seem so deep and so never-ending that often times we feel despair and that God, Himself, has left us. We begin to think that we alone, abandoned. Down in that valley is where we need to remember that God is still there with us and has given his rod (discipline) and staff (authority) to comfort us. It is there that the Word is somehow drawn out of us (assuming you put in there in the first place) and we recall that it is not God who has abandoned us but rather the accusations and trials have come from the enemy, an enemy who God said we are to condemn (Is 54:17). As we rise up to take that authority, we realize God has been with us all along. He was still God in those bad times. And He is, as the above lyrics say, God of the day AND God of the night. When it seems like Friday, we must remember that Sunday is coming, that God has a plan for our lives, and that we have the victory. Hallelujah! Our God reigns. The story of Balaam, the soothsayer, is in the Book of Numbers, chapters 22-24 with New Testament writers warning about Balaam on three separate occasions. With that in mind, the story must contain important lessons for us. Balaam is a strange and intriguing personality. He is a baffling combination of supernatural spiritual gifts and corrupt character. Sometimes we can see this combination in ministers and leaders today. When the story of Balaam opens, Israel is encamped on the border of Canaan. The King of Moab, Balak, was apparently afraid of the Israelites. Balak viewed the Israelites as a threat to his kingdom, although they had done nothing to justify his fear. Feeling unable to confront Israel in battle, Balak decided to use spiritual weapons against them. He sent some of his princes, with a fee for divination in their hands, to the Israelites. Balak called for Balaam to come and put a curse on Israel. As a soothsayer, Balaam had a reputation for uttering blessings or curses with a powerful effect for good or evil. It is interesting to note that Balaam came from a town in Mesopotamia. He was not an Israelite, yet he had direct personal knowledge of the one true God. In Numbers 22:18 Balaam refers to God as “my God” and knew his sacred name. When Balak’s princes arrived, God told Balaam not to go with them and not to curse Israel. Balaam obeyed. So Balak sends a larger party of more honorable princes with a promise of a much greater reward. This time God gave Balaam permission to go on one condition: “If the men come to call you” (Numbers 22:20). Interestingly enough, there is no record that the men did come to call Balaam again. Yet he went, and by his disobedience incurred the anger of the Lord, who opposed him on his journey and nearly killed him. This is a great side story of how the donkey Balaam was riding saw an angel blocking their way and even spoke to Balaam when he began to punish the donkey. Finally, however, the Lord did release Balaam to go but with the condition: “Only the word that I speak to you, that you shall speak” (Numbers 22:35). Balak welcomed Balaam and made the most elaborate preparations for him to curse Israel. But each time the result was exactly the opposite. Altogether Balaam uttered four prophecies, which are among the most beautiful and powerful revelations in Scripture of God’s irrevocable commitment to bless Israel. Thwarted by God in his attempt to curse Israel, Balaam proposed a different strategy against her (see Numbers 31:16). If the Moabite women could entice the Israelites into idolatry and immorality, it would not be necessary to curse them! God Himself would bring judgment upon them. Balaam’s second strategy succeeded and 24,000 Israelites perished under God’s judgment (see Numbers 25:1-9). This story leaves us to ask ourselves: What motive could be powerful and compelling that it would cause Balaam to act in direct opposition to the revelation he had received from God—to his own ultimate destruction? Two writers of the New Testament answer this question. Speaking of false teachers in the Church, Peter says: “They have forsaken the right way and gone astray, following the way of Balaam the sone of Beor, who loved the wages of unrighteousness” (2 Peter 2:15). Jude likewise, speaking of false teachers, says: They…have run greedily in the error Balaam for profit: (Jude 11). The answer is clear. Balaam was tempted to his own destruction by the love of money. For this he was willing to prostitute his marvelous spiritual gifts. Probably he was flattered too by the attention he received from King Balak and his princes. The love of money is closely associated with the desire for popularity and for power. All of these evil lusts grow out of the selfsame soil: pride. Sounds like some of our church and government leaders, doesn’t it? What are the lessons to learn? First, Almighty God has made an irrevocable commitment to establish the Jews as His people forever (get over it if you think otherwise). There is no power in the world, human or satanic, that can ever annul this commitment. Even Israel’s own unfaithfulness can never annul God’s faithfulness. Speaking to Israel, Balaam says: “Blessed is he who blesses you, and cursed is he who curses you.” Individuals and nations alike determine their destiny—often without being aware of it—by their attitude toward the Jews. Those who bless are blessed and those who curse are cursed! Second, one of Satan’s strongest and most successful weapons against us is the love of money. This has been true from the earliest days of Christianity until now. A ministry accompanied buy powerful supernatural signs—especially miracles of healing—can almost always become a means of making money. Paul contrasted his own ministry with that of many of his contemporaries with these words: “Unlike so many, we do not peddle the word of God for profit” (2 Corinthians 2:17 NIV emphasis added). many foolish and harmful lusts which drown men in destruction and perdition. from the faith in their greediness, and pierced themselves through with many sorrows. Third, we need to understand the difference between spiritual gifts and spiritual fruit. Gifts represent ability, but fruit represents character. A gift comes through a brief impartation from God, but fruit comes through a slow process of development. Receiving a spiritual gift does not, in itself, change a person’s character. If a person was proud or unrelieable or deceitful before receiving a spiritual gift, that person will still be proud or unreliable or deceitful after receiving it. When we pass from time to eternity, we will leave our gifts behind, but our character will be with us forever. Balaam’s clear vision of the blessed end that awaits the righteous is shown by his prayer: “Let me die the death of the righteous and let my end be like his!” (Numbers 23:10).Yet Balaam’s prayer was not granted. He was executed with the Moabites, whose money had tempted him to align himself against God. Balaam’s story and the lessons learned from it are so current, not only in the Church but in our government as well. Each day in this election year greed among our officials and candidates for the highest offices in the land seems to be the driving force. Public service has become a means to great wealth. Certainly “service” is a misnomer these days. Not only greed but lying, cheating, and stealing, have become the norm and seemingly what the public accepts as normal. Around the 4th. Century b.c.e., Alexander the Great with his Greek armies conquered the near east including what is now called Israel. After his death, his empire split apart. The land of Israel came under the control of the Seleucid dynasty, which ruled in the region of Syria. In the year 167 b.c.e., King Antiochus Epiphanes decided to force all the people under his rule to Hellenize (to become like the Greeks). The practice of Jewish rituals such as the Sabbath and circumcision was outlawed. The worship of Greek gods and sacrifice of pigs replaced the traditional worship in the Temple. Some Jews eagerly flocked to the gymnasium, the symbol of the Greek emphasis on the beauty and strength of the body. Others resisted Hellenism and died as martyrs. One day the Greeks came to the village of Modi’in and set up an altar. They commanded the Jews to bring a pig as a sacrifice to show obedience to Antiochus. Mattathias, an old priest, was so enraged when he saw a Jew about to kill the pig on the altar, that he killed him. He and his five sons then fought the Greek detachment, retreated to the mountains, and began a guerrilla war against the Greeks and their Jewish allies. Before he died of old age, Mattathias passed on the leadership of the clan to his son, Judah the Maccabee. Judah led his forces against a series of armies sent by Antiochus; and through superior strategy and bravery he defeated them all. Finally, he and his followers liberated Jerusalem and reclaimed the temple from its defilement by the Greeks. They could find only one small curse of oil, enough to last one day. But when they lit the temple Menorah (the oil lamp) with it, a miracle occurred. The Menorah burned for eight days. So, we celebrate Hanukkah to remember the Maccabees and their successful fight for justice and to remember the miracle of light. There are two very special themes and symbols that pertain to Hanukkah. They are the number eight and the theme of light. In chapter 10:22 of the Gospel of John, Jesus went into the Temple to teach. The Gospel tells us it was the Feast of Dedication or Hanukkah. On the first night an added prayer is said: “Praised are you, Lord our God, ruler of the universe, for giving us life, for sustaining us, and helping us to reach this moment.” Then the shamus is used to light the other candles. The candles are lit from right to left. These lights are sacred for all eight days of Hanukkah. It is forbidden to make use of them, except to look at them in order to praise God for his miracles, wonders, and triumphs. There are two customs associated with Hanukkah: the giving of gelt (money) to children and the playing of the game dreidle. The “gelt” is usually in the form of chocolate coins. Dreidle is a top that is spun and on each of the four sides is the Hebrew letters: nun, gimel, heh, and shin. This forms an acronym for the phrase “neis gadol hayah sham—or “a great miracle happened there.” And, once again, in Israel the letter shin is replaced with a peh for the poh—so that it reads: “a great miracle happened here.” Another interesting fact is that each of these letters (nun, gimel, hey and shin) has a numerical equivalent that adds up to 358, the same number as the letters of the word “messiah.” It is the Messiah who is the author of miracles! Secondly, it is customary to eat foods fried in oil, to remind us of the miracle of the oil. So we eat latkes—potato pancakes. Here is a popular recipe: 3 large potatoes, 1 small onion, 2 beaten eggs, ½ cup of vegetable oil and salt and pepper to taste. These are then usually eaten with applesauce or with sour cream. During the eight days and nights of light, the Maccabees cleaned, purified and rededicated the Temple. In the Torah (the first five books of Moses), dedications take place on the eight day—remember the first-born animals are consecrated to God on the eighth day. Hebrew boys are circumcised on the eighth day. And, even today, before a sanctuary can be rededicated, it must undergo a seven-day period of purification. 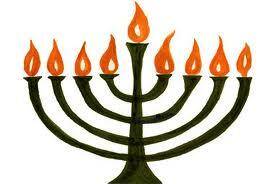 Thus, the word ‘Hanukkah’ means rededication and also the number 8 signifies the same in Hebrew tradition. The last day of Hanukkah has a special significance. It is called “zot Hanukkah” which literally means “this is Hanukkah.” This is the time when the menorah is at its brightest (Psalms tells us that the path of the righteous is like the light of dawn that grows brighter and brighter until the full day). And that is what the fully lit Menorah represents. This number eight carries a special meaning. It is one beyond completion. Seven is completion. When creation was complete, God rested. Seven marks the limits of time and eight is beyond time. Eight signifies the eternal. So the eighth day is the essence of Hanukkah and a reminder of the light that is ever present in this world. Thus, Hanukkah is the time of dedication and renewal. The old altars that have become impure, are torn down and we rededicate ourselves and our temple to the service of God. Since Jesus said he was the light of the world (and the Menorah represents God’s gift of light) I would like you to consider the following: light gives of itself freely, filling all available space. It does not seek anything in return; it asks not whether you are friend or foe. It gives of itself and is not thereby diminished. So, if His light is in us, are we not to do the same?